Narcoterrorism wreaks havoc on the world as drug cartels operate as dominating, murderous dictatorships. The powerful Irish Drug Cartel has set up drug manufacturing plants around the world and they will kill anyone who gets in their way. Sarah is an ambitious policewoman from an antiterrorist unit. 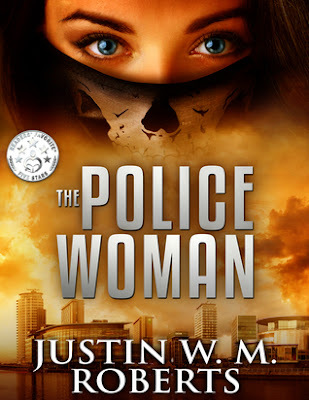 She's also smart, beautiful, and extremely good at her job, which is why she is assigned to an Interpol Incident Response Team in Manchester, set up to find and stop The Cartel. Alongside colleagues from the United Kingdom's SAS, she must quickly learn new Close Quarters Battle tactics and apply them to a vengeful and threatening battlefield. Sarah's investigation appears to be going well until the fight turns personal. She must now struggle to save her friends, family, and even herself. Spanning the globe with a keen knowledge of special forces tactics and some genuinely shocking twists, this book warns of a bloody, drug-addled future we may soon face. The idea of narcoterrorists operating in Buncrana, Inishowen, was my initial draw to this action thriller. However, the action packed sequences and the tense atmosphere that pervades the entire story line had me riveted. I love a good villain and they couldn't be more evil or depraved than the leaders in this drug cartel. The action scenes were exciting and played out cinematically. My favourite action moment was when Sarah and Michael defended themselves against at an attack in a restaurant. It flowed seamlessly like a well performed dance routine. Another favourite was their operation in Buncrana. The idea that these foreign organisations could co-operate with Irish authorities and operate a mission like this in the Republic, a stone's throw from Northern Ireland, really blew my mind considering the history of the region. I was hugely impressed with the research the author made in writing this book. He has an obvious understanding and knowledge about Northern Ireland and how organised crime, the drug trade and terrorism never went away after the peace agreement, they simply adapted to a new order. I could identify with everything the author wrote about in this regard. The author also has expert military knowledge which is evidenced in the very detailed descriptions and identifications of weapons, tactical training and the different techniques used by the various organisations. For the average reader like myself, the amount of detail and the overabundance of acronyms was too much at times. I appreciated the information at the beginning of the book as it set up my understanding of the various military and police organisations. However, having no understanding of weapons, ammunition and tactical communication codes etc meant that I was glossing over these very technical passages. I felt that the Buncrana operation was more bogged down in technical detail than the scene in the restaurant which is probably why I preferred the latter scene overall. I wanted to cut quick to the action and I didn't really care about the technical aspect. Another reader with knowledge and interest in military and police procedure would no doubt find this all very interesting and appreciate it more than me. I am more interested in the human side of the story and again I was impressed with the author's ability to weave in friendships and romance and evoke an emotional response in the reader. There was also quite a lot of humour; various quips and teasing had me laughing out loud. I really got to know and care for the characters in this book. I would have liked the characters to have been described in more detail. The author describes the sound of a bullet entering the human skull but descriptions of characters are limited to how they resemble singers/celebrities. I never picture famous people in the books I read, preferring my own mental image and I found it strange that the descriptions were not more fleshed out. The Policewoman, although set in the future, is a very realistic thriller. It is based on today's reality which makes it all the more terrifying.